Thee price has been lowerd $46,000. The owner wants the boat sold this fall This year all bright work has been redone. Cloud Nine has just had her props, shafts and bottom redone last year The teak stern has been refinished and well as all ports re-bedded This boat has a great extra large salon with a cruising range driven by 1200 gal of fuel and 5oo gal. of water. Grand Banks Europa 52 Partially taken from a Boat International article, June 1999 The Grand Banks 52 Europa epitomizes the classic trawler yacht and is a seaworthy design intended for extensive use. Dag Pike describes this latest success. The Grand Banks has set the trend for the classic trawler yacht, and over the years the designs have progressively expanded upwards in size while still retaining that distinctive look. The builder, the continual development of its sites equates to a consistent improvement in the models, one of which is a new launch, the Grand Banks 52 Europa. This boat started life in a different form. Originally, it was the GB 49 hull fitted with an integral GRP bathing platform, extending the length to 52 ft. This boat came from a new mold where its waterline length is now a full 53 ft. 6 in, resulting in a considerable increase in the internal volume. With the bathing platform added the overall length is 56' 5". The Europa label refers to the styling of the superstructure which is mainly identifiable by the twin sloping fashion plates on each side, giving a smoother, more flowing line to the design. The hull owes little to fashion and more to a seamanlike style. The stem is nearly vertical, curving up from the forefoot in classic style. At the stem, the transom is an uncomplicated, slightly rounded shape. This hull has a low chine which hardens towards the stern while a deep skeg on the centerline extends well below the propellers, offering good protection. The flat run aft allows the hull to almost plane the speed is equally happy running at displacement speeds of around 10 knots which opens the door to long range cruising. Low bulwarks surround the full walk-around main deck and leave space for a generous cockpit aft. These then taper down towards the rear and are supplemented with stainless steel rails topped by a beautiful varnished teak handrail. A pulpit forward keeps the anchor chain well clear of the gleaming topsides and the traditional feel is heightened by the extensive teak decking. The superstructure sits high on the hull allowing a full-height, level walk-in from the cockpit. It is almost box-like in form, but the angled wheelhouse windows and the fashion plates help to integrate the shape which runs off forward into a low coach roof. Above is a large flybridge, again rather square in outline and while this description may sound unflattering, the overall impression of the exterior is of a sound, sensible, well-balanced design which offers more to the requirements of seamanship that to fashion. This impression is heightened by the simulated planking molded into the GRP topsides which is a Grand Banks trademark. The interior is dominated by hand-crafted teak, mainly finished in a soft matt lacquer. The full-height wood paneling could make it dark if it wasn't for the large square windows and the off-white deck head, but even the latter has teak strips along the joints. The saloon is open-plan with a view right through to the pilothouse windows. Aft is the lounge area with an L-shaped settee around a folding table and with two armchairs opposite. There is an entertainment center in the rear corner and a wet bar situated at the far end, where the stairs lead down to the aft cabins. Forward from here is a dinette on the port side opposite the large open-plan galley to starboard. This galley follows the American style with a large fridge/freezer and plenty of storage space, with some of the deck head mounted to create a partial barrier between it and the lounge. The fundamental style remains the same. At the forward end is the pilothouse, a real seaman's delight with central captain's chair facing a wooden wheel. Most of the instrumentation is mounted on the fascia top with a full chart table and the electrical panel offset to the starboard side. There are opening doors on both sides of the pilothouse which allow good ventilation and easy access forward. Guests are catered for with a two-seater, forward facing settee and a table. The accommodations below offer double and twin guest cabin forward and the owner's cabin aft with the engine compartment further aft to have the master cabin forward of this. The shower and the head compartments are separate and there is generous space for a dressing table and a desk as well as large hanging lockers. Throughout the cabins the teak theme continues, but light colored fabrics help to create a brighter atmosphere. Off-white, easy to clean Formica is used for some bulkhead panels but they are still edged with teak to maintain the continuity. The outcome is an ambience which is soft and intimate, but which at the same time is extremely practical. One feels that these boats are created for living on board for extensive periods and while they may lack some of the sophisticated refinements of the mainstream motor yacht market, the Grand Banks yachts certainly are intended for widespread use rather than just an occasional jaunt. United Yacht Sales New Jersey would love to guide you through a personal showing of this 52' Grand Banks Heritage Eu 52 2000. 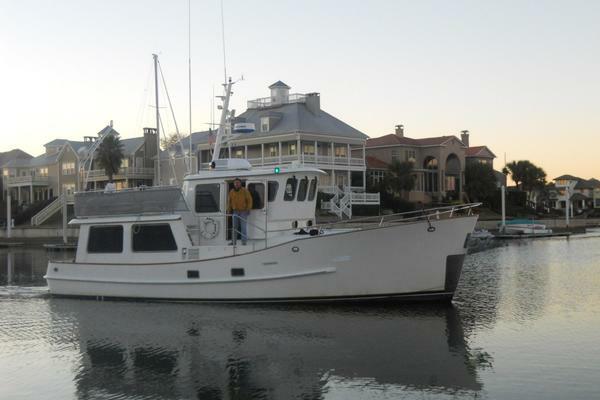 This yacht for sale is located in Newport, Rhode Island and priced at $649,000. For a showing please contact us by filling out the form on this page and we will get back to you shortly! Deck fillers, diesel fuel and water, S.S.